Continued from Stage 27 - page 1. Once through the village take a left fork at the lavadero (where Spanish women used to do their washing in the days before washing machines) and follow the track through the chestnut woods to the bottom of the valley. You will pass by an old watermill and through more chestnut woods until you reach the Iglesia de San Fructuoso, which used to be part of a monastery administering to sick pilgrims at the entrance of the village of Vilar de Corrales. Here too is a fountain. The path continues to wind its way up the mountain passing a farm and another fountain. Keep following the markers through an old quarry and at the road take the path signposted Camino de los Frances into the village of San Fiz do Seo. The path continues to climb for about another 2 kilometres and then descends slightly down a left hand fork in the path. A right hand fork will then take you through some chestnut woods and then down into the village of Villasinde were there's a bar and fountain. As you enter the village take a right turn and fork right by the cemetery down a descending track then across the Puente Viejo into Vega de Valcarce. From here follow the road route to O Cebreiro. O Cebreiro or Pedradita do Cebreiro to give it its full name owes much of its existence to the Camino de Santiago as well as to the many roman roads that passed this way. It is the first town you reach on the Camino Frances as you enter Galicia. The first pilgrim hospital to appear in the town was built in the mid 9th century and was run from the late 11th century by the monks of Saint Gérard De'Aurillac, a French order. Also in the 9th century the monastery of el Santuario de O Cebreiro was built, not much remains other than the Iglesia Santa Maria la Real, considered to be the oldest intact church along the whole Camino. The church was founded by Benedictine monks but came under the control of the French monks in the 11th century after the monastery was given to the French order by King Alfonso VI. It was to remain in their control until the monastery was handed back to the Benedictines by the Catholic Monarchs Ferdinand and Isabella. The monastery was abandoned in the 19th century following the Mendizabal disentailment in 1853, a similar act to that of the dissolution of the monasteries which occurred in the United Kingdom in the mid 16th century. 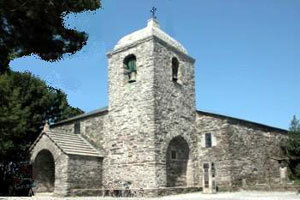 The church underwent a major renovation in the 1960's and 70's initiated by Don Elias Valiña Sampedro, the parish priest. A little bit more on this remarkable man later. Various books tell that "the” Holy Grail was believed to have been hidden in this church during the Middle Ages but what they are actually referring to is a miracle that is believed to have occurred here during the 14th century. The story tells of a single parishioner from a nearby village called Barxamaior who climbed up to the church through heavy snow and a blizzard in order to hear mass. As the priest was performing the Eucharist he had a momentary lapse of faith and whilst he was consecrating the bread and wine he thought to himself, whilst looking at the parishioner sat in front of him “what is this man doing here in this cold weather, just to see a piece of bread and a little wine?”. It was at this point that the miracle occurred, the bread turned to flesh and the wine became blood. This became known locally as el Santo Grial Gallego or the Galician Holy Grail. The relics are kept in the church in a reliquary given to the church by the Catholic Monarchs whilst they were undertaking the Camino to Santiago in 1486, along with the chalice and paten used in that mass. In the church you will also find the tombs of the priest and the parishioner who were involved in this miracle along with that of Don Elias Valiña Sampedro. 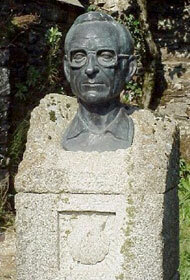 Just outside the church is a bust of Don Elias Valiña Sampedro who was the parish priest at Santa Maria Real from 1959 until his death in 1989 who took it upon himself to restore the church and the ancient hospital (now the Hostal San Giraldo de Aurillac). During his studies at la Universidad Pontificia de Salamanca he wrote a thesis on the Camino's history. He promoted this thesis at various universities across Europe and promoting the Camino de Santiago. Even more remarkable it what he did next. If you were wondering how the signs and markers that point your way on the Camino de Santiago came about then look no further than Don Elias Valiña Sampedro. This amazing man decided to undertake the Camino but found that many of the original paths had virtually disappeared, on his trip he decided to write a book and his Camino guide book was published in 1982. It was then in 1984, along with his nephews, that he started to mark the entire Camino with the big yellow arrows you see today with yellow paint he managed to commandeer from the Spanish department of transport. In 1985 he became a member of the Comisario del Camino de Santiago who were tasked with promoting the Camino and getting others involved and from this came the association known as Amigos del Camino de Santiago (Friends of the Camino). To give you an idea of just how important this man was you just have to look at the numbers who now undertake the Camino. In the early 70's less than 10 Compostelanas were issued, in 1989 when Pope John Paul II visits Santiago over 5,700 Compostelanas were given out and it is estimated that in the holy year of 2010 over 300,000 pilgrims will have received one of these hard earned certificates. 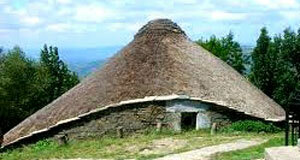 Whilst you are here in O Cebreiro you may want to take a look at the Pallozas, the traditional round stone houses with thatched roofs that the people of this area used as their homes. Some have recently been turned into holiday homes and one of them is a small ethnographic museum. Accommodation can be found at the albergue and 3 hostals including the Hostal San Giraldo de Aurillac, which was lovingly restored by Don Elias. There are also a number of shops, bars and restaurants.